CLOSELY RESEMBLING THE Eric Broadley-designed Lola-Ford G.T.-on which the Ford coupe for Le Mans is based-this American challenge to Ferrari supremacy at Le Mans is also a product of Broadley's board. The power unit, the 4.2-litre Ford V8, with four twin-choke Weber carburetters, developing 350 b.h.p. 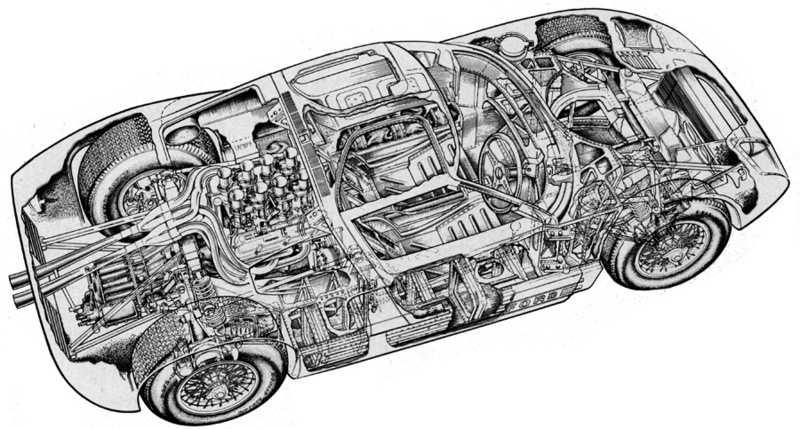 at 7,200 r.p.m., is fitted into the rear of the chassis, and drives through a Colotti Type 37 fou'r-speed gearbox. Dry-sump lubrication is employed, with Ford alternator and transistor ignition. Brake-cooling has dictated the use of Borrani 15 ins. wire wheels, with light alloy rims: the brakes themselves are, naturally, disc-type, of Girling r,nanufacture, and tyres for the extra-wide rims are special Dunlops. Rack. and pinion steering is used, while the front suspension is of double wishbone type, with double trailing links at the rear. The overall length of the car, which has a wheelbase of 7 ft. I I ins., is 13 ft. 3 ins. ; its height is 3 ft. 4t ins., and the body is 5 ft. 10 ins. in width at the widest point. Ground clearance is 4.8 ins., and the car weighs 1,980 lb. Its maximum speed is, theoretically, well over 200 m.p.h.